When it comes to home design, most people focus on the basics — the living room, the kitchen, the bathroom, and the bedrooms. Once you have those covered, though, the possibilities are endless. Depending on your lifestyle, you might turn any extra space you have into a home office, a game room, or any other type of room that’s meaningful to you. Got an extra room in your home? Have you considered a meditation room? Rooms designed for mediation are becoming increasingly popular – with good reason. Today’s lifestyle is hectic and fast-paced. We have little time to think of ourselves and focus on relaxation. 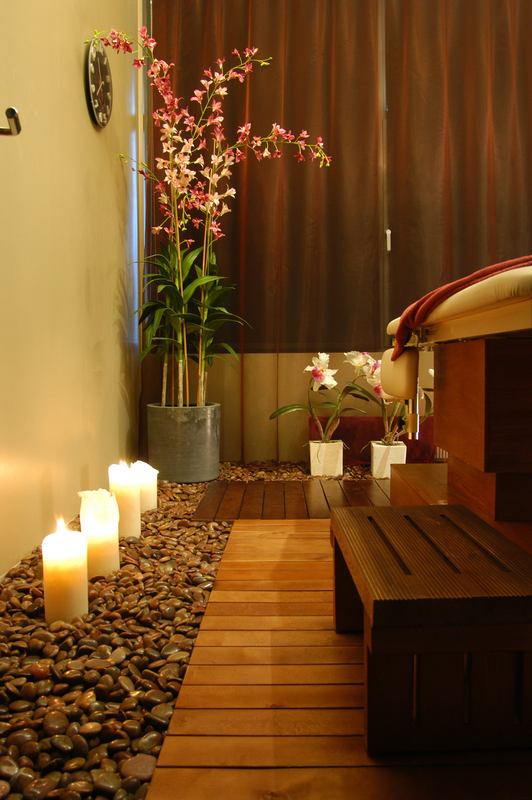 A mediation space in your home gives you a tranquil place to relax and refocus. You can truly get away from it all, right in your own home. Of course, you don’t have to use the room solely as a place to become one with the universe. That would be impractical and likely a waste of space. Many people use these rooms for yoga practice, quietly reading books, working on creative projects, or gathering with like-minded friends. The key to creating a meditation room is to create a small sanctuary, no matter how you plan to officially use the room. We’ve collected these meditation room ideas from across the web to inspire you. Whether you have a small little nook or a wide open space, you’ll see how you can easily transform it into a place where you can recharge your soul. 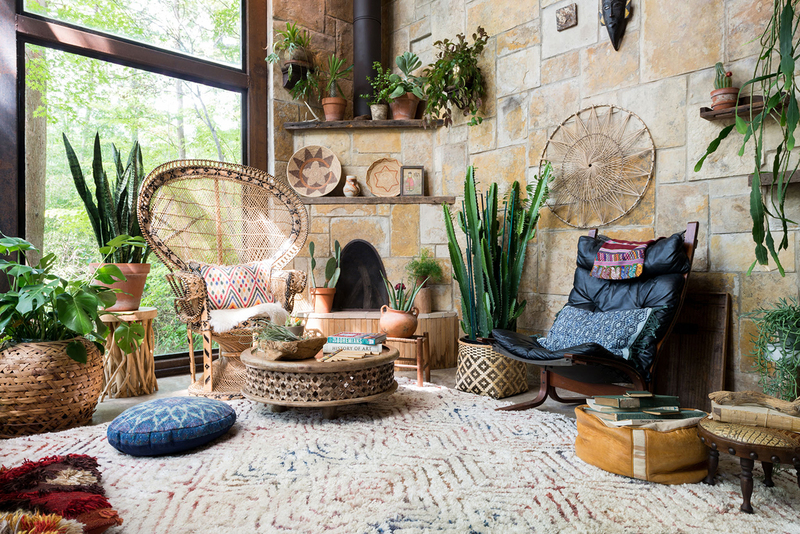 With the wooden home decor and elements throughout the room, along with the doors that open into a gorgeous backyard, you’ll feel at one with nature in this cozy room. Cushions on the floor give it an Asian feel, and there’s plenty of space for two people to focus on their own meditative practices. The large cushion is big enough for laying down, but also adds comfort for those choosing to sit on the smaller pillows. Without a hard wooden floor digging into your ankles as you sit, you’ll have an easier time emptying your mind while taking deep breaths. The stack of cushions in this meditation room design is reminiscent of the Princess and the Pea story, where the princess has to sleep on a large stack of mattresses. The canopy sets this small space apart from the rest of the room, which is a great solution for when you want a little place of solitude, but don’t have an extra room in your home. 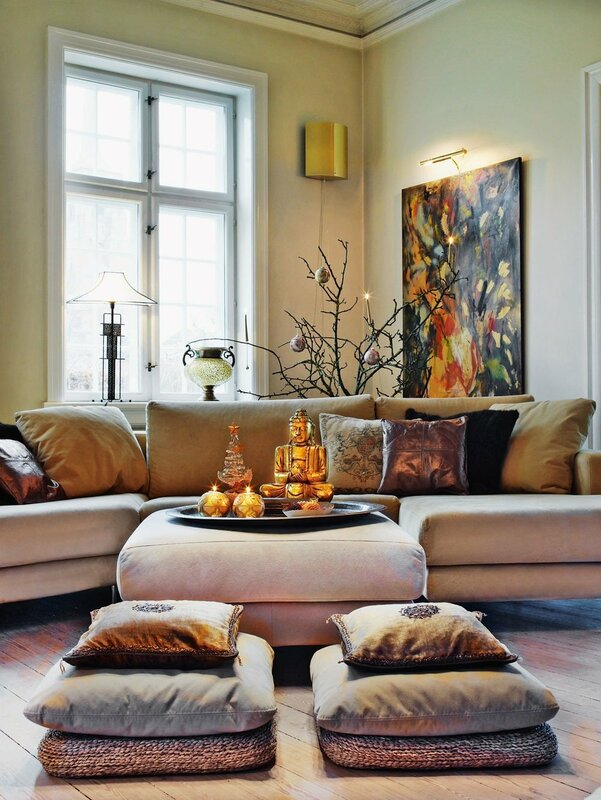 The string of lights set behind the sheer fabric adds a soft, warm glow to the space, and the gold in the fabric, pillows, and frames on the walls helps tie the meditation area in with the rest of the room. Unlike most of the rooms you’ll see in this list, this is an incredibly large mediation room that’s probably separate from the main home. The roof keeps rain away, but it’s still open and airy. This would be an ideal space for someone who’s teaching meditation or mindfulness classes because there are spaces for many people to sit. If you’re looking to take inspiration from this space and put it into a smaller room, pay attention to the way that many candles create a soft flow in the space. The sand pendulum in the center of the circle is also a nice touch that you can incorporate on a smaller scale. The stone walls all but hide the wood-burning stove in the corner of the room, which will make the space toasty throughout the winter months. The variety of green plants throughout the room will keep the space feeling natural year-round, and helps the gaze flow seamlessly to the wooded lot outside. The hodge-podge of furniture, including the different styles of chairs, stools, tables, and cushions goes well with those who prefer the shabby chic and Bohemian styles of home decor. 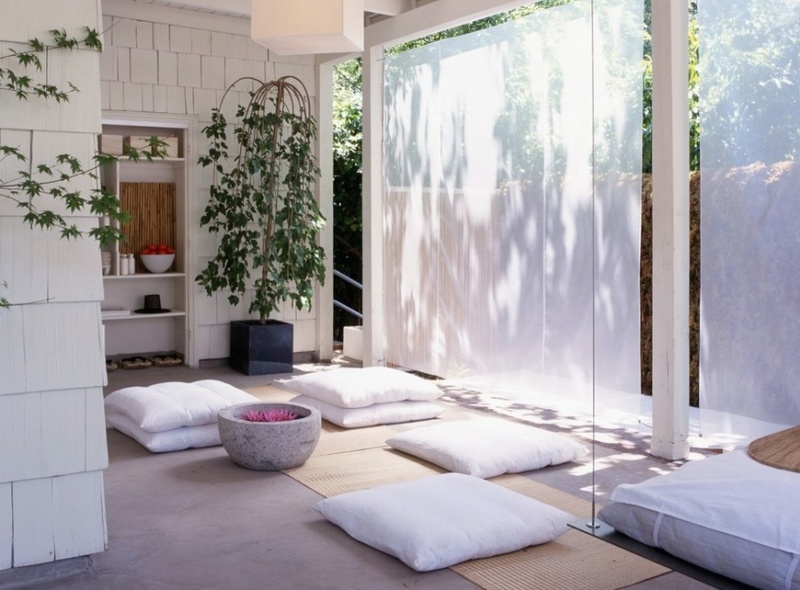 This meditation room idea is unique in that it mimics the look of an outdoor patio inside. 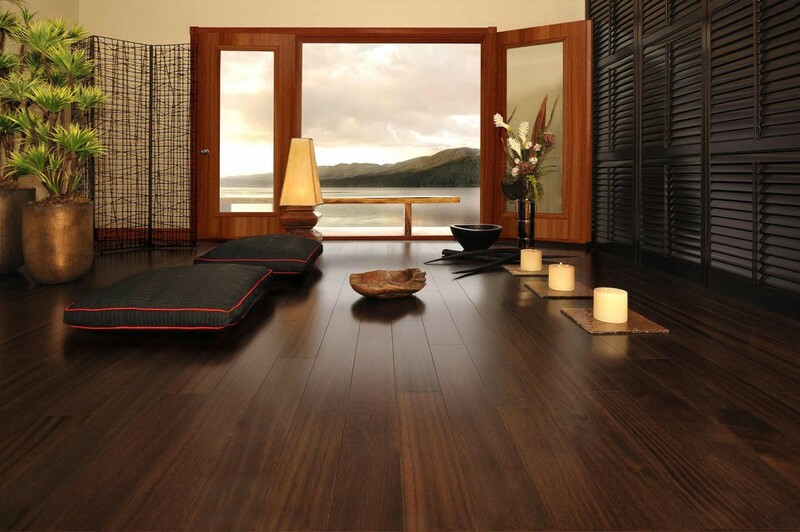 Get this look by laying down a wood floor and leaving a large space around the edges for a rock garden. Candles and flowers really help transform the space, and you can choose whether to sit on the cushions on the raised platform or kneel on the bench. With the look of a Japanese temple, you might find it easy to focus on your meditation practice in this space. However, it could also be used as a quiet space to enjoy tea with a friend. While the idea of a disco might not be something you’d immediately think of when it comes to a meditation room, you can see how easy it would be to become transfixed by the light coming through these panels. With a pattern of circular holes cut out, the sliding panels allow light to dance through. It would be interesting to note how the light changes at different times of the day, which could be a good reminder to take a few moments for yourself throughout the day. However, you can also push the panels to the side if you prefer natural light in the space for reading a book. 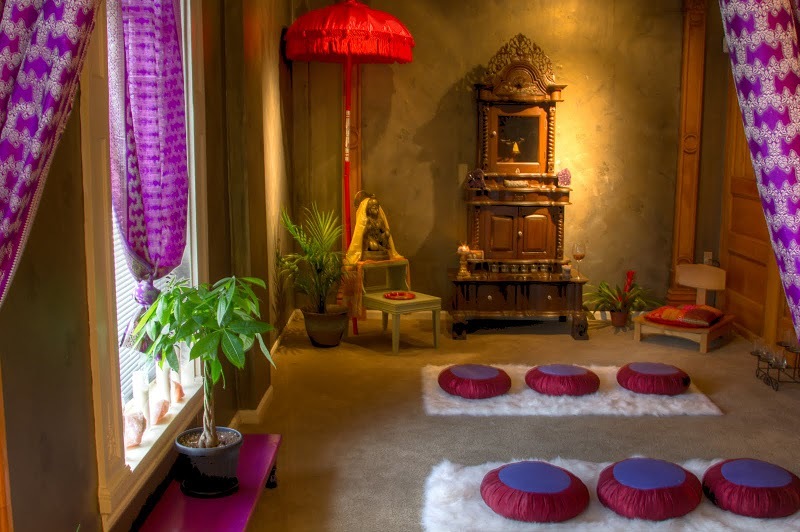 This picture shows how easy it is to take a small part of a room and transform it into a small sanctuary for meditation. All you need is a source of natural light, some flickering candles to focus your energy, a comfortable cushion for sitting, and a few other items that make the space meaningful for you. Note the sage in a small bowl. 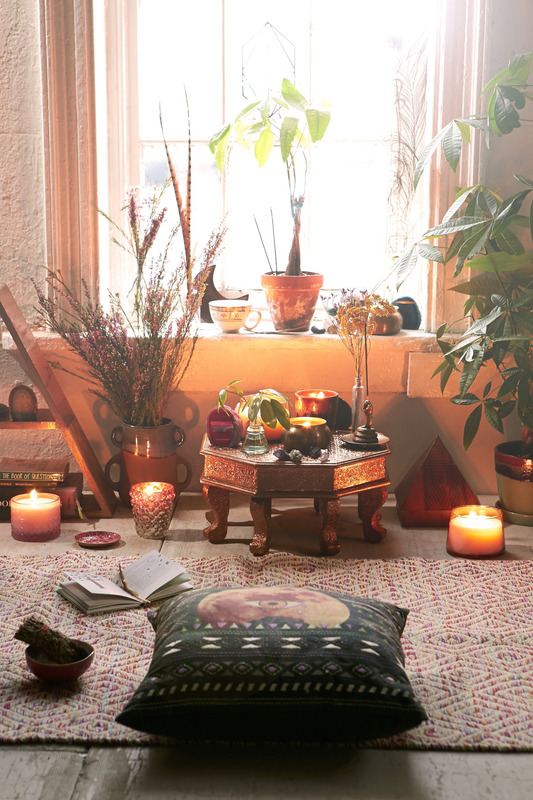 Burning sage or incense can go a long way toward making the room feel calming. Experiment with different scents until you find something you like. If you don’t have a separate room inside the house, why not consider taking it outside? 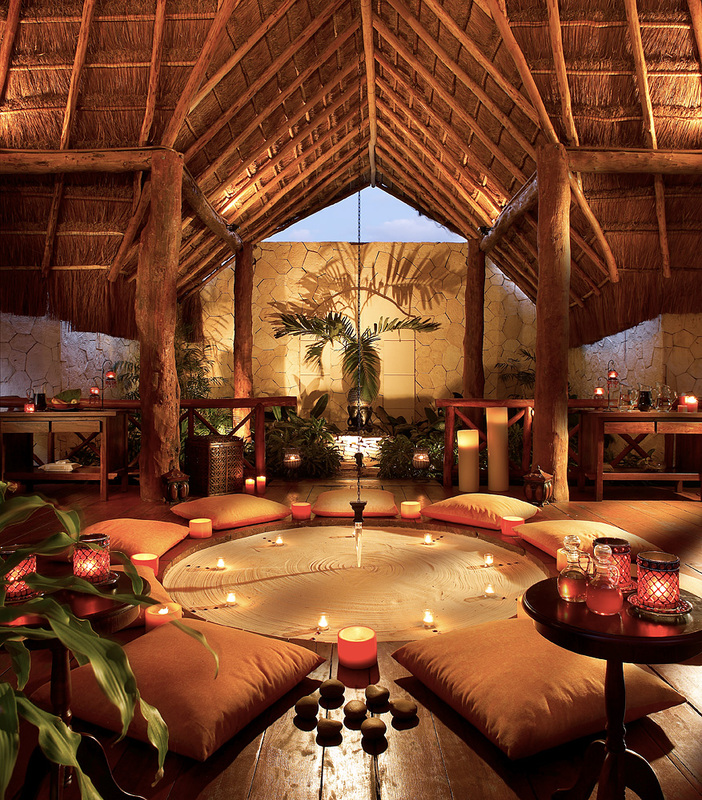 This beautiful space is perfect for mediation, relaxing, or hanging out with friends. Large pillows provide comfortable seating on an otherwise hard concrete floor – or take a nap on the large mattress over to the right. By hanging light curtains along the walls, you’re able to block out some of the sun’s harsh rays while still being able to enjoy the natural light you’d expect from being outside. Try weighting down the bottoms of the curtains, though, if you’re concerned about them blowing into your space. 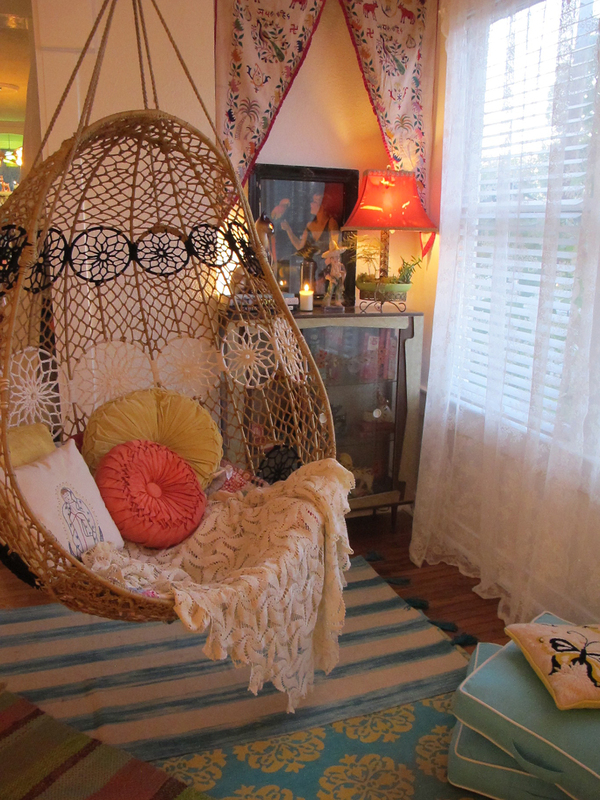 A hanging chair is a perfect fit when it comes to selecting meditation room decor. 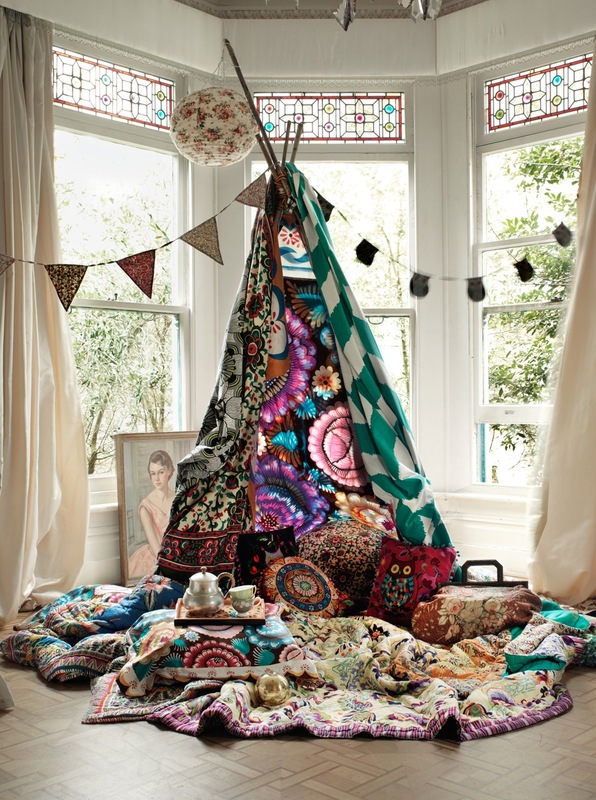 The colorful pillows and blanket design blend well with the chair itself and the other design elements of the room. Sheer curtains provide some privacy while still giving you the ability to take in the view outside. What could be more meditative than rocking the time away in a chair like this? A statue of Buddha is a natural choice for meditation room decor, and it’s well-suited to this room. This room could definitely serve double-duty. Use the cushions when you want to meditate or have some comfortable extra seating for guests, but push them out of the way and use just the sofa for everyday use. When you have a favorite piece of art, like the one hanging on the wall here, it’s a good idea to match the little touches like your pillows to the art, rather than finding art to match the pillows you like. Candles are always a good choice for lighting in a meditation room, but having a selection of lamps as well helps to change things up when using the space in different ways. Many people focus on neutral shades of brown when it comes to meditation room design, because those colors give the space a natural feel. However, some people like a bit more color. 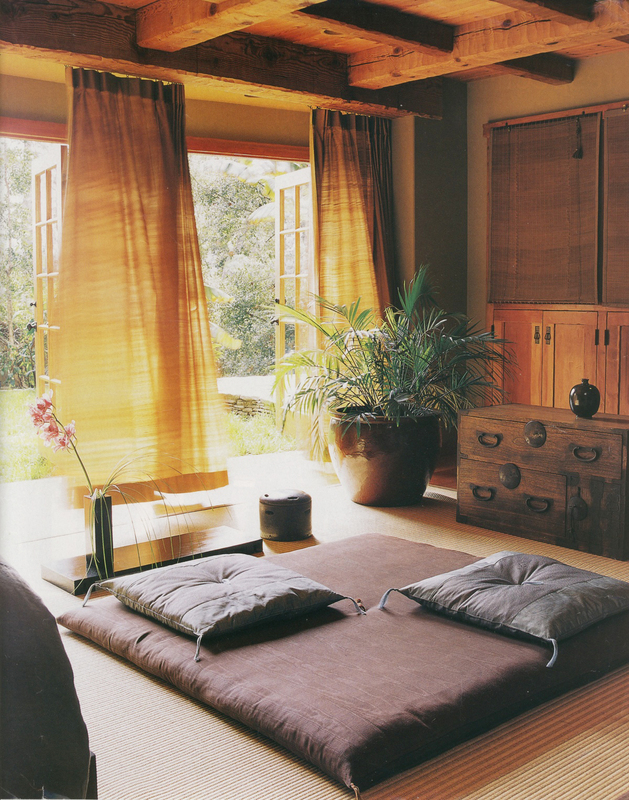 While the walls in this room are a neutral color, the color in the meditation cushions, the curtains, the bench, and the umbrella in the corner give the room a unique look. An ornate alter like this one could hold photos of family members who have passed to the other side or other items that would benefit your meditation practice. In a high-rise apartment, take advantage of the great view by setting up a meditation space near the window. A yoga mat and pillow may be all you need to get started, but the large houseplant adds a bit of color to the otherwise stark space. This tall and narrow shelf is a good solution for those who want to display several meaningful pieces in a small space. Keep just one thing on each shelf to minimize clutter – a cluttered space can make your mind feel more cluttered. Older homes often have these curved alcoves that can be difficult to furnish. Why not transform it into a beautiful space for meditating. 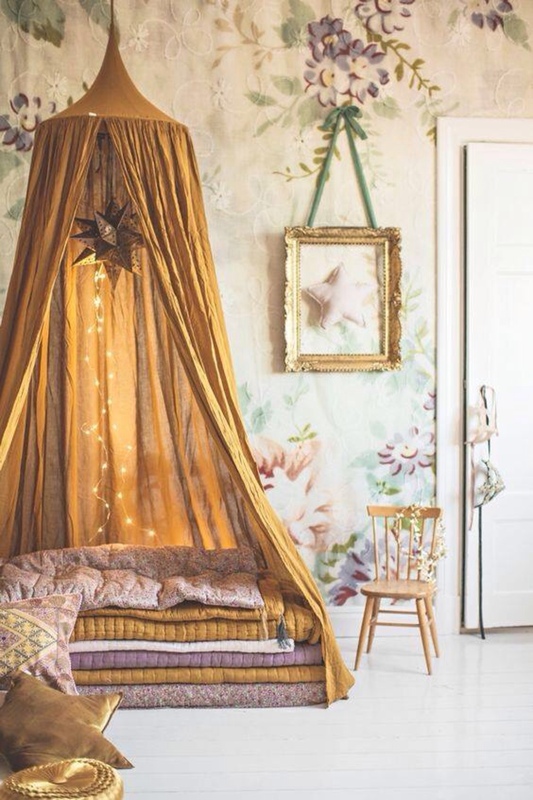 Brightly colored tapestries hung around wooden sticks makes it feel like a teepee, while blankets on the floor and pillows with fun designs give it a comfortable feel. This could be a great little “hideout” for the kids, but the young-at-heart will also enjoy taking a small snack and a book to this creative space. Best of all, it’s easy to take everything down if you decide this isn’t your thing.